Cesarean scar defect is an obstetric complication of a previous cesarean section., Cesarean scar defect is detected as an anechoic area by transvaginal sonography in 24%–69% of women after a cesarean section. It is characterized by thinning or a triangular defect of the uterine myometrium. There are various symptoms of cesarean scar defect including abnormal uterine bleeding, pelvic pain, and secondary infertility., The most frequent complication of cesarean scar defect is abnormal uterine bleeding, but the amount of bleeding is small in most cases. Our patient showed recurrent massive hemorrhage from the cesarean scar and needed blood transfusion and surgical treatment. Massive bleeding such as that in the present case is extremely rare., We report the clinical course and details of the laparoscopic treatment in this case. A 26-year-old female, G1P1, was admitted to our hospital with genital bleeding and hemorrhagic shock. Her blood pressure was 80/59 mmHg and pulse of 86 beats/min. She visited nearby hospital of internal medicine a day before visiting us for the severe genital bleeding that she had never experienced. A physician indicated severe anemia in her blood test and recommended early visit to gynecologist. Her medical history was only an emergent cesarean section for delivery stop 9 years ago. Her menstrual cycle was regular and had no complaints about menstruation before then. Vaginal ultrasound showed only cesarean scar defect; the source of bleeding was unclear. Endometrial lesion was smooth and no evidence of any endometrial polyp or tumor in sonography. Acute bleeding seemed to have almost stopped spontaneously on arrival, but her consciousness was still not clear. We administered crystalloids and performed renal cell carcinoma transfusion for resuscitation. Her hemoglobin (Hb) concentration on admission was Hb 6.0 g/dL. Her serum human chorionic gonadotropin level was not elevated, and results of coagulation tests were normal (activated partial thromboplastin time: 28.4 s, prothrombin time-international normalized ratio: 1.08, fibrinogen: 178.0 mg/dL, and fibrinogen degradation product <2.5 μg/mL). Administration of estrogen-progestin agents for uterine hemostasis was started, and the genital bleeding gradually decreased day by day. We made a diagnosis of idiopathic hypermenorrhea at that time and she was discharged from the hospital 4 days after admission. However, in her first menstruation after discharge, she had massive genital bleeding again she was brought to the hospital by ambulance. She was treated by tranexamic acid administration and the bleeding soon stopped. We also administered low-dose estrogen-progestin (LEP) for control of her menstrual cycle. However, 8 days after starting administration of LEP, severe genital bleeding started again. We continued LEP administration, but genital bleeding persisted and further blood transfusion was required for severe anemia. Her Hb concentration was Hb 6.8 g/dL at that time. 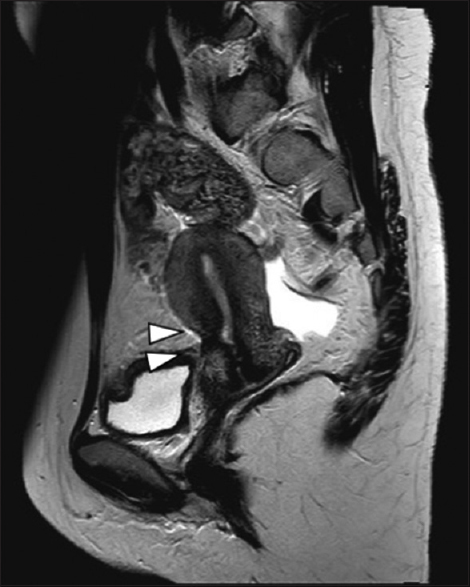 We performed dynamic contrast-enhanced magnetic resonance imaging (MRI) for further examination of the uterus. We found only the cesarean section scar as was shown in a vaginal echo test, but the scar was slightly enhanced in the early phase and was suspected to be the bleeding site [Figure 1]. We, therefore, performed diagnostic hysteroscopy to directly determine the bleeding site. We could not pass the hysteroscope through the narrow diverticulum of the scar, but we found remaining silk sutures on the cesarean scar. We also found atypical dendritic vessels on the surface of the scar [Figure 2]. There were no other notable observations by hysteroscopy. We made a diagnosis of hemorrhage from a cesarean scar. We decided to resect the cesarean scar with the sutures and repair the myometrium by laparoscopic surgery. The laparoscopic procedure was performed with four trocars in diamond position. 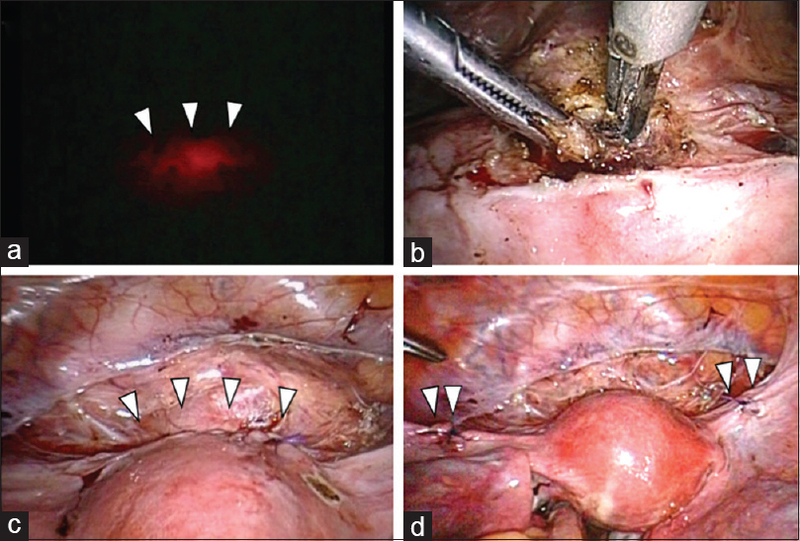 We first confirmed the thinned lesion of the cesarean scar guided by the light source of hysteroscope [Figure 3]a. After peeling off the vesicouterine adhesion, we resected the thinned layer using an ultrasonic scalpel [Figure 3]b. After debridement of the thinned layer, the resected edge of the myometrium was closed by double-layered suture using absorbable monofilament suture. Interrupted suturing was performed for the entire thickness of the myometrium, and continuous Lembert suture was added to the uterine surface [Figure 3]c. We added suture on the bilateral round ligament to fix the uterus in an antenatal position and reduce tension of the sutured lesion [Figure 3]d. An intrauterine device (IUD) was inserted for contraception and prevention of intrauterine adhesion as previously reported. The total operative time was 3 h and 5 min, and there was little loss of blood. She was discharged with no surgical complications 5 days after the operation. She had no severe abnormal bleeding after surgery and only had spotting caused by the IUD insertion. Six months after surgery, we performed MRI and hysteroscopy after removal of the IUD to examine the repaired scar. The cesarean scar slightly remained but was well adapted [Figure 4]. We examined the thickness of uterine muscle before and after surgery in T2-weighted image sagittal MRI. 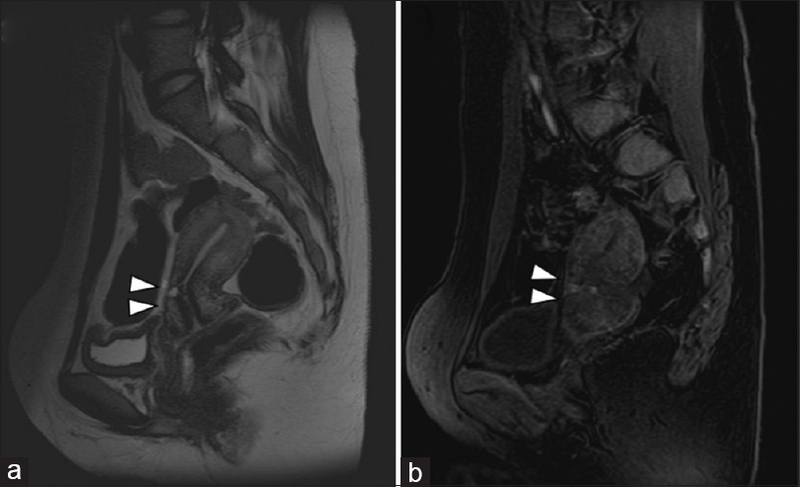 The ratio of thickness of uterine muscle in the most thinned lesion to full thickness of lower uterine segment was changed from 0.14 [1.3/9.1 mm; [Figure 1]a to 0.72 [9.2/12.7 mm; [Figure 4] after surgery. Hysteroscopic examination showed that the atypical vessels had disappeared from the sutured lesion. Therefore, we permitted her pregnancy in the future with detailed explanation about risk of uterine rupture and adherence placental disorders on repaired lesion in pregnancy. The causes of abnormal bleeding from a cesarean scar are still controversial. A previous report suggested that the blood pooling of cesarean scar defect is the trapping of menstrual blood. However, several other reports suggest that the cesarean scar itself is the bleeding point. Wang and Hu confirmed arterial hemorrhage from a cesarean scar and thrombus in the bleeding site by hysteroscopy. Liao et al. also reported two cases of tardive vaginal bleeding caused by rupture of abnormal blood vessels within the cesarean scar diagnosed by hysteroscopy. These cases showed massive hemorrhage and needed blood transfusion and surgical repair as with our case. Such life-threatening hemorrhage from cesarean scar was previously reported only in these two reports and might be very rare condition. Though the bleeding was not severe, Tanimura et al. directly detected the point of hemorrhage using a hysteroscope., Therefore, hysteroscopy is the most important tool for diagnosis of abnormal bleeding from a cesarean scar. In the present case, we could not clearly detect the bleeding point by hysteroscopy, but we found a narrow orifice into the diverticulum of the scar, dendritic vessels, and tight silk-suturing. Dendritic vessels are often observed on a cesarean scar by hysteroscopy, and they are thought to be one of the causes of bleeding from the scar. Therefore, we strongly suspected that the cesarean scar was the source of bleeding. Fortunately, we were able to completely stop the abnormal bleeding by laparoscopic resection of the scar. Many reports have shown a successful treatment course of cesarean scar resection by laparoscopic surgery.,, Almost all reported cases showed disappearance of abnormal bleeding and successful closure of the defect. Regarding conservative treatment, hormonal agents have been reported to be effective for controlling abnormal bleeding. Tahara et al. reported that LEP was effective for recurring vaginal bleeding after a cesarean section. However, in the present case, LEP was not effective for hemostasis of the abnormal bleeding. Therefore, we think that bleeding caused by trapping of menstrual blood on a scar defect can be treated by hormonal agents. However, for bleeding from the cesarean scar itself, hormonal agents may not be effective for hemostasis. In cases of heavy bleeding with a cesarean scar as in the present case, attention should be given to the possibility that the cesarean scar is the cause of massive bleeding. We should perform hysteroscopic examination and rapidly decide the necessity of surgical treatment before the development of severe anemia. Morris H. Surgical pathology of the lower uterine segment caesarean section scar: Is the scar a source of clinical symptoms? Int J Gynecol Pathol 1995;14:16-20. Morris H. Caesarean scar syndrome. S Afr Med J 1996;86:1558.
van der Voet LF, Vervoort AJ, Veersema S, BijdeVaate AJ, Brölmann HA, Huirne JA, et al. Minimally invasive therapy for gynaecological symptoms related to a niche in the caesarean scar: A systematic review. BJOG 2014;121:145-56. Tower AM, Frishman GN. Cesarean scar defects: An underrecognized cause of abnormal uterine bleeding and other gynecologic complications. J Minim Invasive Gynecol 2013;20:562-72. Liao X, Zhang P, Zhang C, Lu G. Tardive intermittent massive vaginal bleeding from abnormal blood vessels within cesarean scar: Two more new cases should bring our attention to a new entity. J Obstet Gynaecol Res 2016;42:726-9. Wang CF, Hu M. Arterial hemorrhage from cesarean scar: A rare cause of recurring massive uterine bleeding and successful surgical management. J Minim Invasive Gynecol 2015;22:305-8. Lin X, Wei M, Li TC, Huang Q, Huang D, Zhou F, et al. Acomparison of intrauterine balloon, intrauterine contraceptive device and hyaluronic acid gel in the prevention of adhesion reformation following hysteroscopic surgery for asherman syndrome: A cohort study. Eur J Obstet Gynecol Reprod Biol 2013;170:512-6. Gubbini G, Casadio P, Marra E. Resectoscopic correction of the “isthmocele” in women with postmenstrual abnormal uterine bleeding and secondary infertility. J Minim Invasive Gynecol 2008;15:172-5. Tanimura S, Hosono T, Minami R, Funamoto H. Hemorrhage from a cesarean scar is a cause of cesarean scar syndrome. J Minim Invasive Gynecol 2017;24:340-1. Tanimura S, Funamoto H, Hosono T, Shitano Y, Nakashima M, Ametani Y, et al. New diagnostic criteria and operative strategy for cesarean scar syndrome: Endoscopic repair for secondary infertility caused by cesarean scar defect. J Obstet Gynaecol Res 2015;41:1363-9. Tahara M, Shimizu T, Shimoura H. Preliminary report of treatment with oral contraceptive pills for intermenstrual vaginal bleeding secondary to a cesarean section scar. Fertil Steril 2006;86:477-9.